Life of a Catholic Librarian: In fall planning mode, and new saint dolls! She is just perfect for me, I think. 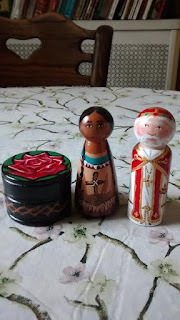 And of course, on the right is St. Nicholas, and he will be gifted to Henry. I'd like to get Anne the wood nativity set from this shop, but it's $$$ :) and I'm waiting to see if there will be a fall coupon code coming up. Well worth the money, for sure, but any little savings helps. Especially since there are roofing guys currently at our house. :-\ I'm grateful we were able to get this done before the weather turns, and the house really needs it, but holy budget blaster, right there. So anyway, back to the original topic. Fall plans. The semester starts up here at the university on Monday, though my kids don't start school until the day after Labor Day. What's in store? Well, I did (aside from a concluding paragraph) complete the short article on Catholic fiction that I was fixing to write. I need to send the abstract in to the editor, and then edit and ready the manuscript, because (hopefully!) she's going to want to see it. So that summer work goal was met, thankfully. And so, yes, I have plans! :) I think what I'd like to do is have a 3 post per week plan. Monday or Tuesday, a longer, amusing, family/life post. Wednesday or Thursday will be a Tea Time video post. Fridays will be for lifey posts too, perhaps a bit shorter than the Monday post. 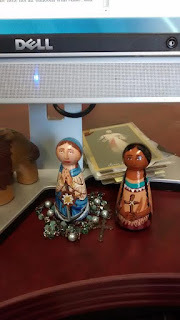 I could also write about Catholic topics on Fridays, maybe some Catholic Nook posts when inspiration strikes, or Advent-related goodness as we approach that liturgical season. I'll still do 7 Quick Takes sometimes, but not every week. I do like those posts, but not all the time. We're free floating spontaneity and inspiration over here at Life of a Catholic Librarian. ;-) I'll obviously pop Catholic Book Club posts up on Wednesdays when those dates come around. And stay tuned for podcast news, because I'm hopeful that something will be ready this fall! What do you all think? What are your favorite type of posts that I write? How would you like to see me structure a posting schedule? All very loosey goosey, mind you, nothing has to be etched in stone around here. But it's nice to have a general expectation, I think, for both you and me, of what will come each week. I'd really love for you to chime in on this, have at it in the comments! Swings. I am a swings fan, which is weird because I'm afraid of heights! But it feels so neat to be sailing through the air. Those saint dolls are just the sweetest little things. I wish my niece and nephews appreciated things like that because those would make great gifts. Kate, I am terrified of the swings. ;-) It feels like my legs are going to hit things! I know, I adore those saint dolls. I like them as much as the kids!